Prime Minister Binyamin Netanyahu’s high dudgeon over the world community’s demand that Israel return more or less to ‘1967 borders’ plays to two audiences, his domestic constituency among far rightwing ‘Greater Israel’ parties intent on usurping Palestinian land, and his American constituency among the third or so of US Jews who oppose trading land for peace. For the rest of us in the US, being yoked to Netanyahu’s angry expansionism is like being forced to date Charlie Sheen. It won’t do our own reputation any good, and it won’t rescue him from his self-destructiveness. The reason Israel has to go back to 1967 borders is that the annexation of territory from a neighbor through warfare is illegal according to the United Nations Charter, which is a treaty to which Israel and the United States are both signatories. ‘Greater Israel’ apologists attempt to get out of this difficulty by saying that countries used to conquer land away from their neighbors all the time. This is a bogus argument, since countries used to do a lot of things, including sponsor the slave trade; Britain even insisted on China allowing the sale of opium in the early 19th century. The world changed when World War II ended and the countries of the world established the United Nations to forestall any recrudescence of Axis techniques of conquest and rule. If Israel does not believe in the UN Charter, it should renounce its UN membership. It is not just the UN Charter. The Hague Agreement of 1907 and the Geneva Convention of 1949 forbid a power occupying enemy territory in war time from annexing it or in any way changing the life ways of its people. Another bogus argument the Greater Israel expansionists trot out is that the UN Charter only forbids the acquisition of territory from other countries, and the Palestinians did not have a country, and so they are fair game. This argument is morally despicable, since the Israelis made the Palestinians stateless, thwarting the intention of the League of Nations that Palestine become a state; and now they are using the abjectness and statelessness as an argument that Palestinians can be stolen from at will. But the argument is also incorrect. Both the League of Nations and the UN made it perfectly clear that they intended that the Palestinians have a state in the future, so in preventing this from happening the Israelis are defying international law. The 1947 UN Partition Plan, the legitimacy of which the Israeli government says it recognizes, awarded Gaza and the West Bank to the Palestinians. So it is not true that these territories are no-man’s land or that there is no legal framework for their people’s existence, such that anyone could enslave them or expropriate them at will. Netanyahu’s argument for not going back to 1967 borders is that it is inconvenient. He says that the 1967 borders are indefensible. This assertion is a logical fallacy, known as special pleading. You can’t launch a war and annex your neighbor’s territory because you fear that your own presents security challenges. Lots of countries are unhappy with their borders. Saddam Hussein annexed Kuwait in 1990 in part because he felt that the British had erred in not giving modern Iraq a deep water port, which made Iraq ‘indefensible’ and put it at an economic disadvantage. Pakistan believes that its failure to secure the headwaters of the Indus Valley rivers in Kashmir in 1947 puts it at a permanent disadvantage vis-a-vis India and makes the country overly vulnerable (‘indefensible’). Netanyahu’s immoral argument that a country just has to take by main force whatever it feels will make it more secure is astonishing and is a standing danger to world peace if it were taken seriously by other countries. International law forbids Israel to colonize the West Bank– not only the UN Charter but also the Geneva Conventions of 1948. But beyond the specious character of Netanyahu’s rhetoric (according to which it would have been perfectly all right for George W. Bush to annex Iraq to the United States), the fact is that the whole tiff over ‘1967 borders’ is a smokescreen for Israeli expansionism. The settler movement could put down settlements in much of the sparsely populated south of Israel proper with no problem. Instead, they insist on taking Palestinian land. They are not colonizing the West Bank only to make it more ‘secure’ (they are making it less so), but rather out of greed, ambition, and expansionism. It is not about defense, it is about offense. Netanyahu rudely lectured President Obama in front of the cameras that the Palestinian desire to see the return of some of the refugees expelled from their homes by the Israelis in 1948 ‘isn’t going to happen’ and he urged Obama to frankly tell the Palestinians that it isn’t going to happen. 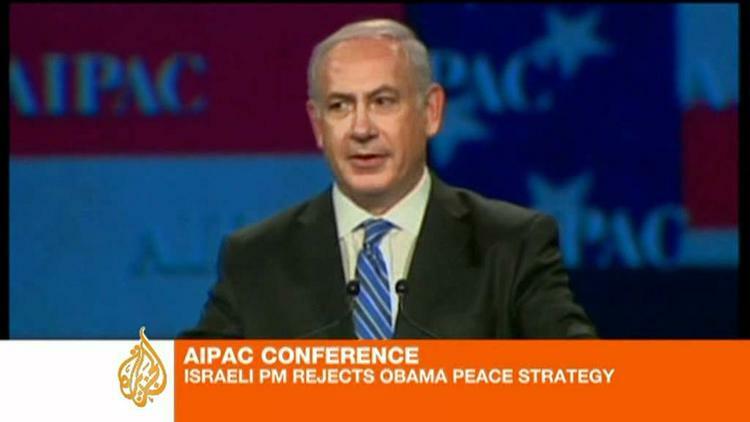 But he may as well also have instructed Obama to tell the Palestinians that the two state solution is dead. Israel by now has not only planted colonies all over the West Bank and moved hundreds of thousands of people in, but it has secretly withdrawn residency rights from 140,000 Palestinians. The ‘separation barrier’ removed another 12 percent of Palestinian territory. No one can look at a map of Gaza and the West Bank as they actually exist and see a viable state that could protect the rights of its citizens (the point of a state). Israel keeps announcing new settlements or expansions of existing ones on Palestinian territory. Netanyahu is saying ‘no’ to peace, ‘no’ to negotiations, ‘no’ to dignity and rights for Palestinians for generations to come. Ben Franklin said that ‘Experience keeps a dear school, but fools will learn in no other.’ Netanyahu’s children and grandchildren and great grandchildren will one day regret that he slapped away the hand of help and the good will of Barack Obama in favor of a stubborn and greedy Israeli expansionism. The most likely outcome of Israel’s present course is a one state solution, achieved over decades, with much heartbreak and violence and ruined lives in the meantime. The Jews of Israel will likely end up like the Maronite Christians of Lebanon. France created Lebanon in 1920 for a then Christian majority, but Christian out-migration and rapid Muslim population growth reduced the Maronites to only about 22 percent of the population today if we count children. Likewise, Israeli Jews have already lost their majority among first-graders in what was Mandate Palestine in favor of Palestinians and Palestinian-Israelis. Current demographic trends will likely produce an Israel that is a third Arab by 2030 and that is not even counting the Occupied Territories. The instability in the Arab world and the Greater Middle East, which is growing, could well over time increase Jewish out-migration (out of sheer nervousness) so that it outstrips in-migration of Jews. I can’t see a way for Israel to escape this demographic and geopolitical fate and remain viable as a nation-state. Plans on the Israeli right to denaturalize and expel the 1.5 million Palestinian-Israelis are unrealistic and do not reckon with the likely backlash from the Arab world, which won’t remain weak and abject forever. (We can already see glimmerings of a new, more assertive Egypt). The course Netanyahu is charting will harm the United States in so many ways they are hard to count. But he is also digging the grave of his own vision of a Jewish state.